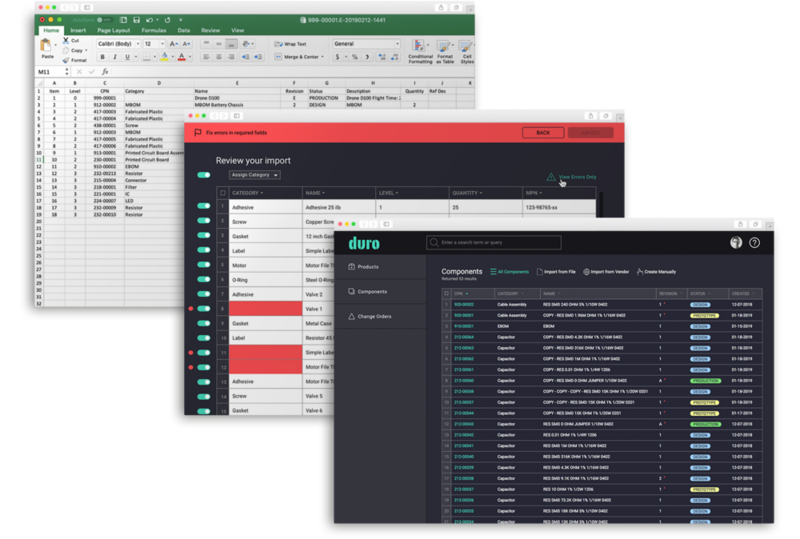 As easy to use as a spreadsheet, Duro packs a powerful set of features that help centralize all engineering and manufacturing-related workflows - keeping your documentation error-free and your project on schedule. Whether your migrating from spreadsheets or from an existing PLM, Duro’s intuitive interface and automated workflows drastically reduce the time typically needed to get started. Duro connects automatically to parts distributors such as DigiKey, McMaster, Mouser, and many others. Pull in part data, pricing and lead time information in seconds with only an MPN (Manufacturer Part Number). Create and issue change orders in seconds with Duro’s intuitive change order management feature. Distribute change orders to your team or any group of stakeholders through a minimal number of steps. Easily set and track BOM variants across your product line. Whether due to customer demand or component availability, Duro allows you to configure variations to your standard Bill of Materials for any product. Duro is your single source of truth, keeping all company or project stakeholders up-to-date and aligned. Achieve true centralization of your product and manufacturing data through Duro.